4 Below is the new alternative rock creation of Oban musician, Andy Bruce. 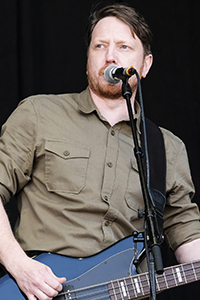 Taking up music in his teens, Andy initially learnt bass playing within a musical group of friends gaining lots of experience with bass. He also gained experience in vocals over the years by playing with numerous cover bands, notably the spirited Signal Fires, delighting many a crowd. Andy was an integral support member for the local rap stars, K9 Kev and Rory-B, the winners of a worthy place at the Oban Live Festival in 2017, to great acclaim. Andy still plays with the popular cover band, The Antics, from time to time. 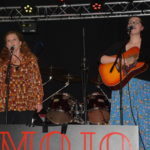 He has, however, recently gained momentum, which started in ‘Signal Fires’ to write and play his own original music, which has gained him and 4 Below their place at MOJO as their first official airing. Joining him on stage will be his wife and former band-mate from Signal Fires, Claire, on keyboards with friend Dougie Galbraith on drums. Some of Andy’s influences are Soundgarden and Biffy Clyro, amongst many others. What 4 Below’s music offers us is a charged atmosphere sound through Andy’s specially-tailored bass, his meaningful lyrics and high-flying vocals with a Scottish lilt. Claire adds to this with her magic on the keys and Dougie bringing up the lively backbeat with his masterly drumming. We have a creation here that can be described as the musical combination of Royal Blood meets Biffy Clyro, a real treat to close the show at MOJO. Andy hopes to continue in more gigging with 4 Below and for further writing and recording of original material. 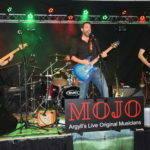 MOJO kicks off on Saturday October 20 in Craignish Village Hall.